Our philosophy is to provide service and advice with regard to the intelligent application of financial principles and products which under the same circumstances we would apply to ourselves. 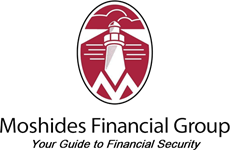 Moshides Financial Group (MFG) helps successful people develop comprehensive financial strategies to support their life plans and address their wealth management concerns. It is the culture of our firm that sets us apart from the rest. From the moment you call our office you will notice a difference. From the friendliness of our administrative team to the attentiveness of our professional registered representatives, one thing is for certain: our collective goal is to listen and help you chart a course to build, manage and protect your assets.